Symantec today has begun warning people about a nasty “419” scam which is trying to take money from people who would like to donate funds for the people of Haiti. A “419” scam (aka “Nigeria scam” or “West African” scam) is a type of fraud named after an article of the Nigerian penal code under which it is prosecuted. Below is a sample of one 419 style scam already circulating on the internet. 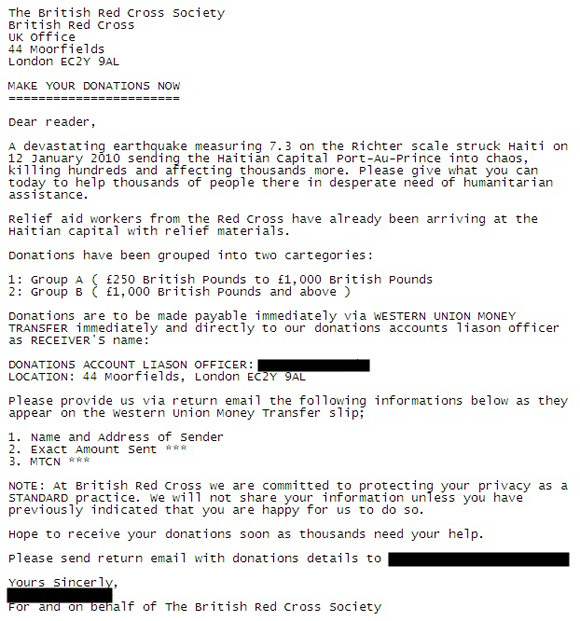 The scammers used the correct postal address for the British Red Cross, and there is indeed a British Red Cross appeal for donations to help the victims of this disaster, but the BRC do not use Western Union for donations. Also, the email address supplied for contact is not one belonging to the BRC. Any money sent using the instructions in this email would not help anyone in Haiti; it would end up in the pockets of a criminals. “Exploiting tragic world events for personal gain unfortunately seems perfectly acceptable for some cyber criminals, and the Haiti Earthquake 419 advance fee fraud example highlights that there are no boundaries on what they’ll attempt to profit from,” said Matt Nisbet, Malware Data Analyst, Symantec Hosted Services. From a disaster is absolutely disturbing. Sentence of not less than 20years!